Steve Hackett — in-depth interview with former Genesis guitarist Steve Hackett detailing his recent “Genesis Revisited” tour and views on preserving the band’s musical heritage. Armando Gallo – interview with the legendary photographer/journalist known foremost for his work chronicling Genesis’s vintage era. King Crimson – overview of the classic band’s ongoing return to the tour circuit, including observations from bassist Tony Levin. Pat Mastelotto – in-depth interview with King Crimson member on the band’s innovative lineup incorporating three drummers. Rocket Scientists – interview with keyboardist/leader Erik Norlander about the band’s latest activities and new album. Ian Anderson – interview with Jethro Tull’s main man about his latest solo album and live performances. Carl Palmer – interview with the iconic drummer about his live show and desire to perpetuate the musical legacy of Emerson, Lake & Palmer. Quaterna Requiem – interview with one of South America’s foremost symphonic progressive bands. Nick Magnus – interview with prolific U.K. session artist about his new solo album. The Custodian – interview with leader Rich Thomson about the U.K. group’s debut album and future plans. Jonas Reingold – Flower Kings bassist provides updates on his various projects, including Karmakanic and Barracuda Triangle. Heliopolis – story on new Los Angeles band rising from the ashes of former act Mars Hollow. Fish – announcement of the singer’s plans to end his touring career. ShroomAngel Records – overview of the Texas-based archival record label with owner Richard Patz. 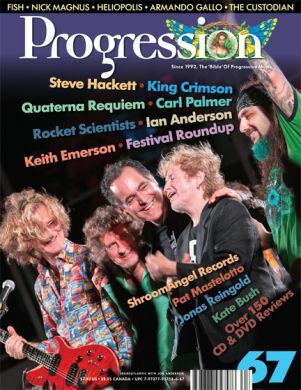 Live report roundup, 2014 – looking back on a banner year for progressive music performances, including coverage of Cruise to the Edge II, Progressive Nation at Sea, Progtoberfest, Rites of Spring Festival and ProgDay Festival, plus concerts by Keith Emerson, Steve Hackett, King Crimson and Kate Bush.